Langley Castle. Of course! Why hadn’t I guessed that we were heading to the 14th century fortified tower in Northumberland? I’d had two clues but had been none the wiser. The first that we’d be going to a place beginning with an ‘L’. The second was that it lies west of Newcastle. I should have known! We’d driven past the castle on the way to Allendale just a few weeks ago. I’d even suggested that we pause to visit. Langley Castle is now a luxury hotel with a fine-dining restaurant. Langley Castle is roughly 35 minutes’ drive — slightly under 30 miles — west of Newcastle-upon-Tyne. It wasn’t until turning off the A69 near Haydon Bridge that I realised where we were going. The occasion was a surprise night away, including a three-course meal in the castle’s restaurant. The castle is a luxury hotel with nine bedrooms inside of the castle, several of which feature four-poster beds. The pick of them, apparently, is the Derwentwater Room — named after the Earls of Derwentwater, erstwhile owners of the estate. Before checking in I couldn’t help but examine one of the freestanding suits of armour on display opposite the reception desk. Medieval history has always fascinated me. Living in the north-east of England means that it’s relatively easy to visit places of interest from that brutal yet intriguing era. Due to long-running intrigue and hostility between the English and Scottish crowns — including periods of warfare and invasion — the county of Northumberland has more castles than any other in the country. 18 of the bedrooms are in the estate of Langley Castle. A manor house was converted into Langley Castle back in 1350. Stone from nearby Hadrian’s Wall was repurposed to construct the fortification, which has walls seven feet thick. In 1405 a fire ripped through the castle, destroying its interiors. A pleasant spot for tea and scones…the drawing room at Langley Castle. The breadth of the walls helped ensure that the shell of the structure survived into modern times. Framed black and white photos, displayed in the bar, show the castle in various states, from a ruin in Victorian times. During one of the battlement tours, which begin in the drawing room at 10.15 each morning, we learnt that Langley Castle had stood as a ruin for five centuries. A gentleman named Cadwallader Bates purchased the estate back in 1882 and set about restoring the castle until his death three decades later. His widow, Josephine, after whom the castle’s restaurant is named, continued to realise his vision of restoring the fortification. A stained glass window in Langley Castle, dedicated to saints sharing the name of the restorers of the medieval fortification. The castle was utilised as barracks during World War Two and has also housed a school. After seeing the wooden staircase my mind flashed to visions of something akin to Hogwarts, of the Harry Potter novels, but it was, in fact, a girls’ school. Medieval-style banquets were also hosted in the castle during the 1970s. While on the staircase on the way to the drawing room — where sofas and armchairs are ranged beneath tapestries and stern looking portraits of men and women who lived during the Middle Ages — my eyes were drawn to alcoves containing heraldic shields. Seats would have fitted nicely below the coats of arms. They are, it is said, among the finest examples of a 14th century garderobe in all of Europe. A garderobe, in case you hadn’t guessed, is a medieval toilet. Which way to the garderobe? These, in Langley Castle, count among the finest examples in Europe. Upon arrival we were served tea and warm scones, accompanied by jam and clotted cream, in the drawing room. We returned to the vast room for a pre-dinner gin and tonic. The food served during the three-course dinner impressed. The lobster bisque risotto starter and roast grouse main were the standout dishes. Service, when it came to refilling water and takes wine orders, could have been more attentive. For breakfast we ordered Craster kipper and eggs benedict and helped ourselves to smoked salmon and orange juice from the buffet. On an ideal day we would then have gone walking along Hadrian’s Wall but tumbling autumn rain put paid to those plans. 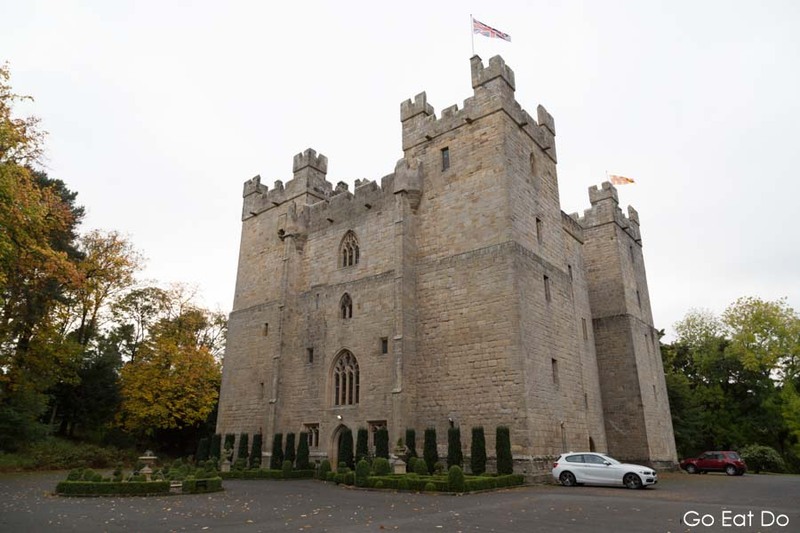 As the location for surprise meal and overnight stay Langley Castle proved memorable. It seems the gauntlet is down — to use saying derived from issuing the challenge to a duel medieval times. I’m now going to have to raise my game when it comes to choosing date night locations. All part of life’s rich tapestry…a night away at Langley Castle in Northumberland, England. Langley Castle Hotel (Langley-on-Tyne, NE47 5LU; tel. 01434 688 888) has nine guestrooms inside the castle and 18 more within its grounds. Mark Percival is the chef at Langley Castle, whose ground floor Josephine Restaurant serves a three-course table d’hote dinner. The property’s Glass Pavilion, with floor-to-ceiling windows, seats an extra 30 guests. The castle also hosts conferences and wedding receptions. Discover more about the attractions of Northumberland on the Visit Northumberland website. You can also find things to do and see in England’s most northerly county on the Visit England website. Wow! Staying at this place would be a dream come true. It’s like going back in time. Is this castle easily accessible? Hello Agnes, Yes, from Newcastle it’s a 35-minute drive. If you’re using public transport you can disembark the train at nearby Haydon Bridge then take a short taxi journey to the castle. It’s a fun place to visit.